Job-role based (in the case of Blue-collar workers) and Real-life use-case based (in the case of Urban migrants) Audio-Visual interactive Content is streamed from the Cloud into the MultiBhashi Mobile app for convenient learning on-the-go. Users have the convenience of interacting with a module unlimited number of times while progressing through various learning stages starting from Beginners through intermediate and Advanced levels. The Content is presented in byte-sized Mobisode chunks for interactive learning & reinforcement. Apart from the convenient pace at which each individual chooses to learn, the content shown follows Adaptive-Learning by applying algorithms to personalise the learning content by profiling a user’s behavioral patterns, grasping power of complex subjects, accuracy of response in quizzes and several other parameters. 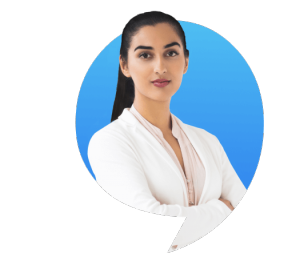 The learner is shadowed by an online mentor who can be approached at any time during the learning process to seek support, handholding, troubleshooting or any other help pertaining to the subject or product feature. The Chat will be Vernacularised in the near term to maximise it’s appeal and comfort for users. Multibhashi runs a proprietary algorithm that continuously learns the user’s traits, comfort level with the content and other psychometrics to evaluate and adapt to the learner’s pace and capability. 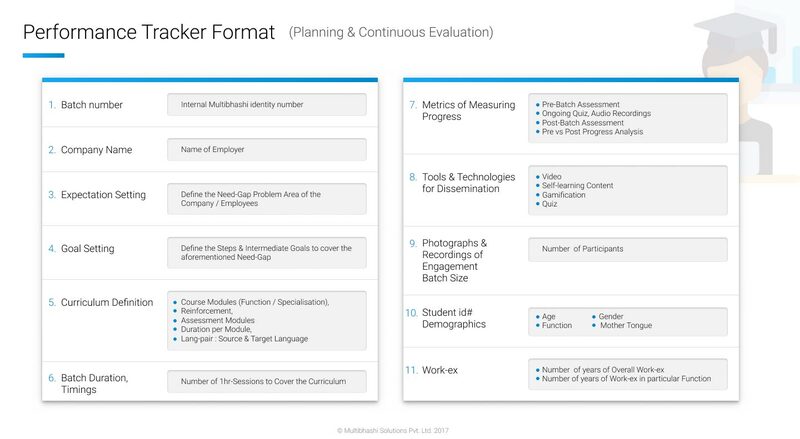 Other explicit measures to assess such as MCQs, voice-enunciation, translation, exam formats are used to elicit the user’s level of understanding after each Chapter. For Enterprises that use the platform to up-skill their employees, a dedicated Reporting Dashboard is made available for monitoring the progress of each employee during the tenure of the course. 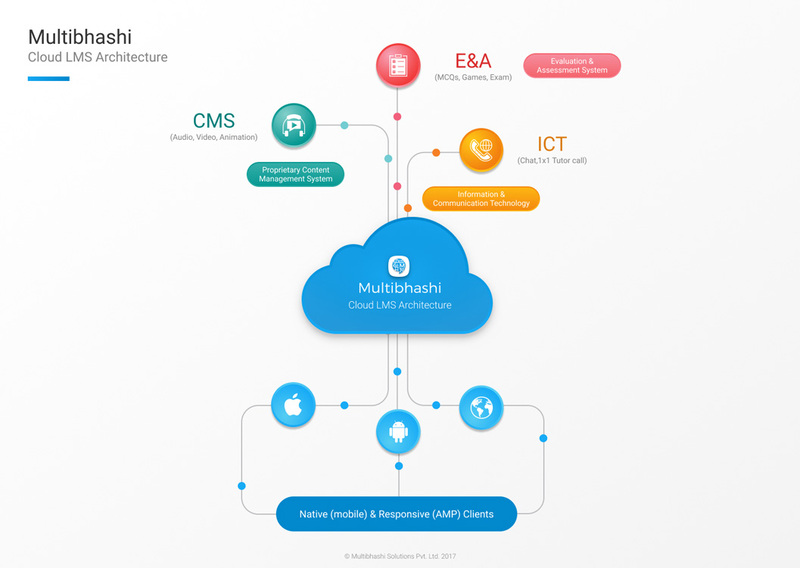 Multibhashi has built a state-of-the-art platform that harnesses Cloud Technology to deliver dynamic and interactive content to users who might access our content on low-bandwidth networks to high-speed low-latency networks with an up time of 99.99% for a homogeneous and consistent User-experience for enhanced learning. Learners who want greater personalised involvement, confidence building & motivation to UpSkill can access remote real-time Tutor interaction by fixing dedicated time-slots to conduct sessions via Video (Skype) or Cloud Telephony (realtime recording & logging for audit). The learning experience breaks from monotony by gamification of the experience through gratification via in-app currency, unlocking subsequent levels of learning, score leaderboard in order to enhance motivation levels by driving the spirit of competition via a unique in-app User experience. Multibhashi language learning platform can be used to enhance Employment Opps of Blue-collar Workers who wish to learn spoken-English in their mother tongue as instructional medium. The learning material will be focused on Learners’ job-role for holistic applied learning rather than a purist training. Multibhashi language learning platform can be used to simplify the Integration of Migrant Urban Milieu who move from their hometown to urban pockets of skill & hi-tech. Such diaspora requires to interact with local incumbents for their daily needs & chores such as travel, kirana purchases and several real-life use-cases that would enable them to mingle with local society in a more integral manner. Enterprises who have the need to localise their global content for local consumption and maximizing their Outreach can contact Multibhashi’s empnalled dossier of linguists who can enable such high grade localisation of assets such as Text Books, Journals, Magazines, Digital assets, Movie sub-titling and more. Enterprises who have the need for dedicated Face-to-Face learning for their employees in a physical classroom format over a condensed crash course instead of self-paced / leisurely learning can avail Multibhashi’s Experiential Training Services through it’s localised empanelment of linguists across the country.